Really made great progress on the dirt project today. I finished down to the dock and then the few low spots along the lakefront to the picnic table. 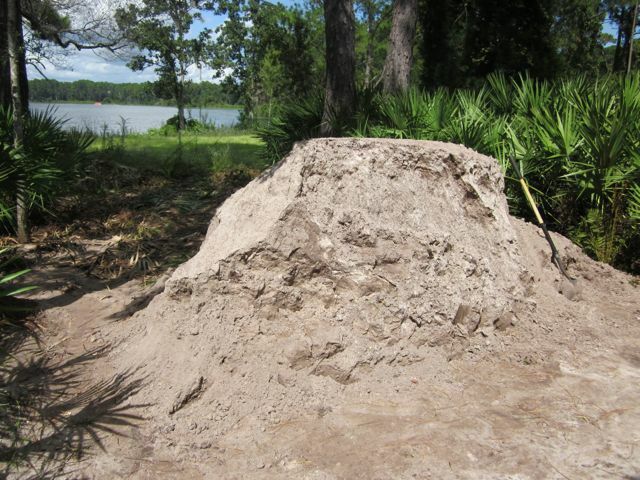 The pile is down to slightly more than half which could be enough to finish the total job – if not finish, get very close. I hope to be finished by the end of the month. The good news is that with all that dirt shoveling and moving, I’m not hurting at all. In past jobs, I was hurting – back, legs, neck, and arms – and I think I know why. This is the first time I’ve done the whole job myself with no help and that’s allowed me to set a comfortable pace and to mix the job. With two people, one guy is stationed at the dirt pile and fills wheelbarrows, two or three usually, and the other guy wheels the dirt down to the dump site then turns around and comes back for another full one. So it’s non-stop doing one job or the other. 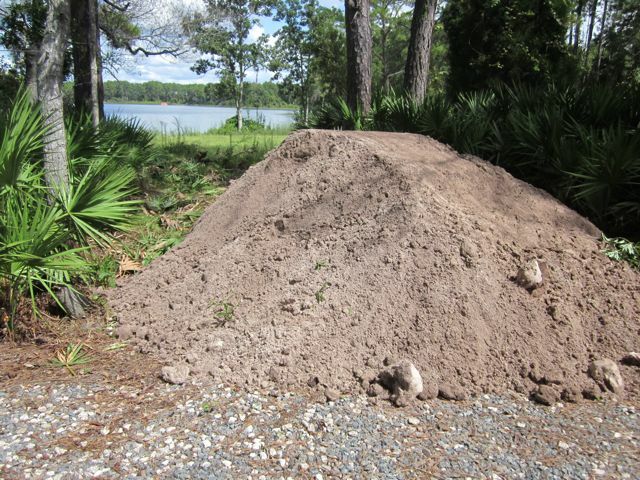 By myself, I fill a load, walk it down and dump it, then rake it in and then walk the wheel barrow back to the pile and start the process again. I think that mixing it up like that is much easier on the body. That plus I control the break times. If I get too tired, I just stop at the dock and feed the fish or cast a line. You can’t really do that if you’re working with a partner. I’m not working against any particular schedule but I wanted to get it done before the holiday season, before we go to the beach for our fall break, and all ready for the coming graduation season. We have no graduation parties scheduled but with as many as four possible, the lake could certainly be a candidate for the party(s). One thing interesting, after completing the path, any animal that walks it leaves tracks. Today there were bear, deer, and raccoon tracks. The raccoon was no surprise but the bear and deer were. I knew a bear was lurking about since it nailed my trash can last week but have never actually seen a deer that I remember. Based on the number of deer track on the path, there were either a full herd or one dancing around quite a bit. I have my fingers crossed that they don’t find the garden. I’m a bachelor again. Nancy left Thursday for her annual trek to Utah and will stay until the following Saturday – 10 days. The freezer is loaded with little plastic containers labeled “dinner for Joe” or “lunch for Joe” so I guess I’m covered in the eating department. There are at least half a dozen containers labeled soup and enough boxes of cereal to last till the end of the year so I’m covered from every direction. On thing I notice right away is just how quiet it is with her gone. The phone never rings, no sewing machine chatter, pots and pans banging, closets opening and closing, dishwasher noises – loading, unloading, or running; the TV is never on during the day, no reminders to take my meds, eat lunch, take the trash out etc etc etc. It’s just eerily quiet. We lost a friend of more than 40 years this past weekend. Judy had a heart transplant about 12 years ago but succumbed to cancer within a week of it being diagnosed. Jerry had spent a few days here last month so this is all quite sudden and unexpected. I am working the fill project by setting daily objectives rather than holding to a time limit or wheel barrow load count. After three days I’ve got roughly 3/4 of the path down to the dock completed and will finish that part of it tomorrow, weather permitting. 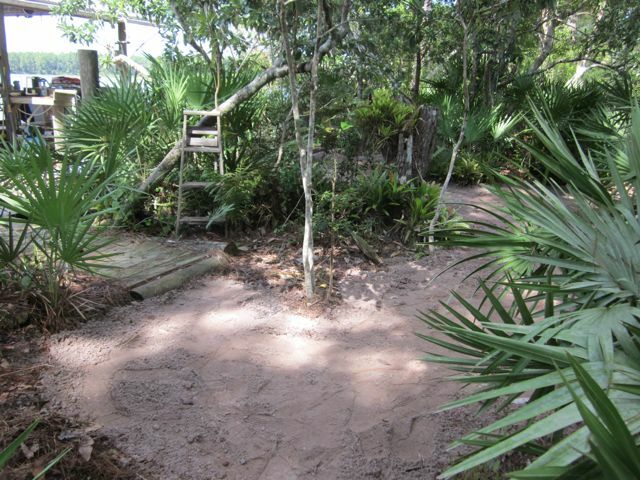 Then maybe a day leveling the area down by the dock. 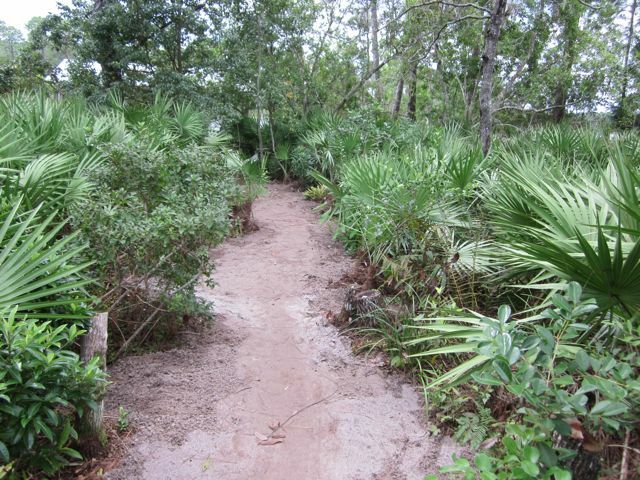 I’ve been spending about 3 hours a day but some of that is clearing brush, not just moving dirt. 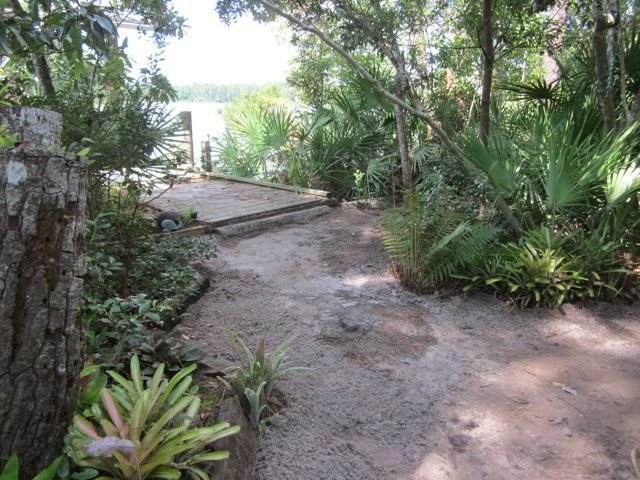 It’s too soon to say but I think I’ll have more than half of the fill dirt left after finishing the path and dock area. I’m hoping that’s enough to do the job on the view area but I’m thinking it will be close. The pictures show the dirt base but that will be covered with pine needles etc to restore the natural look. I never believed the Jack and the Beanstalk story. Anyone who’s grown pole beans know the vines would never support Jack, let alone the giant. That was before I grew the Smerelda beans. I pulled those down a few days ago and trust me, they would support me and a giant. I put down a layer of new compost and then planted peas in the same space, a heritage variety named Alderman which traces back to 1835. I also put in a 15’ row split between cabbage and broccoli, 12 plants total. I had planned to wait another two weeks to put those in but we have a 4 day stretch of wet, cool weather which is perfect for setting out new plants. A little nostalgia – the last VW van comes off the assembly line Dec 31. We’ve had one in the family since 1979 so a moment of silence is in order. Anyone notice that the media has totally dropped Syria from the news. After Obama was so badly punked by Assad and Putin, they put that hot potato down. Is there any doubt that both of these characters have briefed Iran that this is the best time to get sanctions lifted and pay nothing for it? I smell pile on for the next couple of years. Mean time, the press has moved on to Clinton and hope we forget all about the mess in the middle East. The lake is perfect – perfect level, perfect temp. We swim almost every day for an hour or so and my only complaint is that the fishing could be better. I’m doing lots of manual labor in the jungle and being able to just strip down and dive in makes it all workable. What manual labor would that be? I just had another full load of fill dirt delivered after swearing I would never do that again. A full load is 20 yards or about a jillion wheel barrows full. 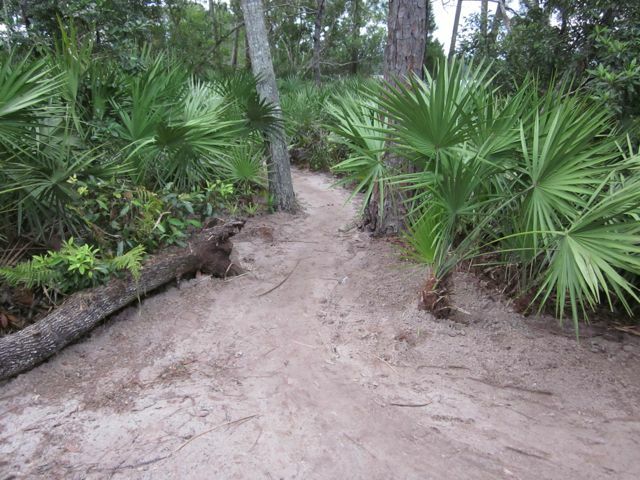 What’s happened over the past years is that the fill I did on the path to the dock has slumped such that the path is now rolling and there are too many exposed roots just waiting for someone to trip over. Think Nancy. I also cleared a major swath of jungle a year or so back to improve the view of the lake from the house and that needs to be filled. I wasn’t concerned about that because it was only to enhance the view but it turned out to be a tempting pathway which is a bit dangerous because of the stumps and roots. I’m going to set myself some daily limit, either a number of loads or a time but I’ve promised myself not to overdo it. We are coming up on October so it will be cooler or not so hot and we don’t have any big social event scheduled that would force the issue. I even borrowed my neighbor’s small wheel barrow so I can’t shovel a load to big to move without risking a hernia. If things hold true to history, the only muscle discomfort I’ll endure is a sore neck. I must have weak neck muscles and rolling a heavy wheel barrow stresses it. The other thing that will make this load easier to deal with is that I’m having it dumped quite close to the paths. The last load was about 300’ from the target area and that wore me out. I’ve mentioned several times that one of the risks with growing cucumbers and squash is that both are prone to infestation by butterfly larva – aka little worms aka caterpillars. The butterfly drills a micro hole in the fruit then deposits an egg which hatches and finds itself born in a food source. This year has been very mild from a butterfly attack standpoint but still occasionally one finds it’s way in. I’ve been trying to examine the fruit more closely while it’s still small and pick the ones that have been breached first. Cleaning around the critter is easy if you catch it early, before it’s really eaten too much. Yesterday my neighbor told me about his solution and I tried it on today’s harvest. I picked three zucchinis and noticed tiny pin holes in one of them. His solution is to soak the zucchini in ice water, literally a bowl of water with ice cubes, and the worms are supposed to come out on their own. Sounded like it could work and sure enough it did. Out came half a dozen or so small white worms about 1/2” long and a little bigger around than 6 pound test fishing line. I’m sure they wouldn’t have lasted a few seconds in the frying pan but getting rid of them before cooking seems so much better. You may recall that a few months back I officially gave up on Tomatillos for this season and cut them up for the compost pile. Three months later, the stems have shown no signs of decomposing so the pile is just too rough to even think about using. I normally expect usable compost within 3 months of stopping new input to the pile. That led me to a decision to break out the chipper and run it all through. The problem with that path was that it has been at least a year and probably closer to two years since I’d cranked up the chipper and my history with gasoline engines is that the likelihood it would start was slim to none. It had been cantankerous the last time I used it and I nearly wore myself out pulling the starter cord. Amazingly it started on the second pull and never missed a beat for the next hour. The tomatillo branches are now chipped into micro particles. One of the wheels did fall off when I was walking it back to the shed but that looks fixable and this is like having an old friend back. I mentioned a few posts back that I had put my tomato plants into the main garden. After a week it’s looking like I had 100% success with the transplant. Usually transplanting this time of year is problematic because it’s so hot and the sun is so intense but I’ve learned to create sun shades from palmetto fronds and that seems to have done the job. It may be an old wive’s tale but planting basil next to tomatoes is supposed to improve the taste of the tomatoes so I decided to plant some basil seeds, but that wasn’t going so well – probably too hot. Surprise! Today when I was weeding, I spotted a newly sprouted basil plant. Upon closer examination, I spotted half a dozen. They were very close to where a couple basil plants spent the summer and went to seed so it shouldn’t have been that big a surprise but I really don’t recall ever seeing them reseed before. Maybe I wasn’t paying attention and pulled them out generically with the weeds. Anyway, I dug up a couple and moved them over next to the recently planted tomatoes. Picked the first zucchini. It was perfect – no little worm holes or soft spots. There are four more on the bushes and loads of new blossoms so perhaps we’ll actually get a decent crop. The foliage and plant stock are really looking good with no signs at all of the mildew or fungus I usually see as the plants mature and no signs of heat distress. That means no nematodes working on the roots. Also picked what may have been the end of the pole beans, or at least this particular batch of pole beans. No complaints at all. My plan is to wait until the end of this month and replant the spot with snow peas or green peas. The trellis I put up a few months back worked perfectly. At one time I had a third of it supporting cucumber vines and another third, the beans. Both were really dense with foliage and, while the load was evenly distributed with the cucumbers, the beans were top heavy so there was quite a load on the whole trellis during storms with no sagging on leaning. Nice job Joe. It now has new cucumbers, new pole beans, and new melons just starting to climb so by the end of this month, the trellis should be 100% planted. I plan to add another 20’ to the trellis, using the remainder of the 50’ wire mesh roll I bought a few months back. It’s clear I can use all 50’ for at least 9 months a year and going vertical is a real space multiplier. The goodies are easier to pick too – bye bye bush beans. Kerry and Obama are the Laurel and Hardy of Foreign Policy. I don’t know which of them is the worse embarrassment but as a couple, they’re unbelievable. Even after giving up the evening national news, somehow I still can’t avoid hearing about them. I read one comment which made the analogy that Putin is playing Chess while Obama and Kerry play tic tac toe. Chris sent Nancy a new cookbook and for the last two nights we’ve had something new (to us). He had been using the book for a while and described various dishes to Nancy who then asked for the recipe. He claims it was easier for him to just get her a book of her own than continue copying and sending. The meals come out looking like a picture from a 5 star eatery – Big Rig on steroids. The dishes included 3 vegetable products that, to the best of my knowledge, I’ve never eaten although there’s a good chance they were buried along side or inside something I knew – Parsnips, Arugula, and fennel root. I knew what they were but had never eaten or had any desire to eat them. Now I’m trying to figure if I can find some room in the garden to try growing them. Just to be on the safe side, I ordered some seeds for all of them. I started the winter veggie seeds today. That may seem early and it could be a few weeks ahead but it’s generally 6 – 8 weeks from when I start the seeds to when the plants make it to the garden so that puts them out to the end of October. Among the seeds started are two varieties of broccoli, cauliflower, Jersey Wakefield cabbage, two varieties of Kale, collards, onions, leeks, and three varieties of lettuce. I’ve never tried leeks before and one variety of Kale is also new to me. It’s called black dinosaur and is an Italian heirloom variety. How can that be bad? I’m holding off on things that need to be directly planted in the ground such as carrots, beets, radishes and spinach until the soil temp drops at least 20 degrees. One more garden note – there are a couple zucchini’s forming on the bushes. That just seems so fast to me. I’m going to track them daily and make sure I pick them before the critters get to them this season. If I can just save half! About 20 years ago we took a trip to London, doing all the normal touristy stuff. It seemed like every evening we would end up at some old Anglican Church worn out from walking and looking for a place to sit down and relax. Turns out they have a service called Evensong, I guess every day or at least every day in tourist season. It was always peaceful and enjoyable music. Last week Nancy spotted in the paper that the local Episcopal Church was having an Evensong recital and suggested we go. I wasn’t interested in whatever NFL game was opposite the service so, in a weak moment, agreed to go. So we ended up in a church, Sunday night, with no wedding, funeral or Baptism involved. It was certainly warmer than London and the church was smaller and no doubt newer, but it was just as relaxing. The music was excellent with most of the musicians being part of the faculty in the Stetson U Music Dept. The other thing we noted was that the average age there was probably 100. Super Shave update – almost at the halfway point with 75 shaves and 8 months into it. Hurricane update – we’ve now passed or tied the latest date ever without a single hurricane. Even the “named” tropical storms have only lasted a few hours before being downgraded back to depressions. I thought the supposed warmer water was going to make this the most active season ever. What that tells us is that the Hurricane Center can’t forecast a season in advance and also, assuming they can accurately measure water temp and that it is actually warmer, that warmer water does not lead to more storm activity. Personally I never thought there was a connection in terms of activity but do suspect a link in intensity once a storm forms. It’s an energy thing. The good news about Florida having a lousy football team this year is that I’ll get more fishing done on Saturdays. Since Tebow and Hernandez were dropped by the Pat’s, I wonder if they could sign up as Gators again? Got to try out my lake grown surf bait sooner than I expected. George came over yesterday and suggested we try the beach so I jumped all over it. My concern with the shiners wasn’t whether of not blues would eat them but whether they’d hold up in the surf – shiners are soft. I had a solution in the back of my mind which was to freeze them in salt water if necessary. That usually toughens stuff up. Not to worry. The shiner pieces held up well and we both caught bluefish. This is a big deal for us since we can almost always catch a few shiners for either fresh use or frozen for future use. George also tried a bluegill but didn’t get any action with that. I’m not ready to give up yet and will try a couple next time. We have our fall beach break early in November and that will provide ample opportunity to test the effectiveness of the shiners vs mullet, the natural bait for the beach. I have the garden platted with 13 rows for planting. Of those, 9 have already been planted including the row of 8 tomato plants I put in today. The other 4 rows will be planted by mid October with cabbage, broccoli, and maybe kale. The cabbage plants are in the seedling stage; the others, still a figment of my imagination. One segment of the current crop of pole beans will be finished by mid October and replaced with snow peas. So the new season is well underway. Last post I mentioned the pole beans were a mix of Smerelda, Roma style beans, and conventional Blue Lakes. I paid particular attention to the beans this week since they can be picked daily and noted that all the beans are the flat Roma’s even though they’re clearly on Blue Lake stock. The combination is very productive and tastes great so no complaints in either department. I have started a tranche of the Blue Lakes at the opposite end of the trellis, 20’ of separation and I’m fairly sure all the Smerelda’s will have died off by then so I’ll have a good comparison by the end of the season. Several decking planks on the dock are rotting (after only 8 years) and I started replacing them with composite decking from Lowes. We noticed right after installing them that they were definitely hotter to the touch than the wood, uncomfortably hotter. I need to replace several more planks so I called the manufacturer to see if there is a coating available to cool them down. Nope. The guy I talked to said they’ve done extensive testing and in the sun, the planks will get anywhere from 30 to 50 degrees hotter than the ambient temp. So if it’s 90 out, the planks will be 120-140 degrees. We can’t have that on the dock so it looks like the only answer is to replace bad boards with new (wood) ones. The upside to that is the cost of wood is 1/3 the cost of composite; the downside is that I have to stain it every now and then. I’ve always been a newsy so it’s with much regret that I’m officially tuning out. I watch a half hour of local news and an hour of national news in the morning; a half hour of local news at noon; an hour of local, a half hour of National, and an hour of PBS news in the evening; and sometimes a half hour of local news at 11PM. I read the WSJ daily and listen to an hour or two of Fox News on XM every day. I’m fairly well calibrated on all the biases and adjust what I’m hearing accordingly. This news addiction is nothing new. It was always the routine in my house when growing up and mostly that way in my own household. Now, for the first time, I’m clicking off National News and PBS completely. It’s too painful and embarrassing to watch this administration fumble about on foreign policy and have jokers like Assad, Putin, and the North Korean Kim jerk Obama’s chain. He needs to go back to some community in Chicago and organize it; he sure as hell isn’t ready for prime time. For me, the most depressing part of it all is that we have over 3 more years to endure. I’ll have to satisfy my need for news by paying more attention to which convenience store got robbed in Orlando the night before. Well the Patriots resolved my conflict by cutting Tebow. I’ve never like the Pat’s but when they hired Timmy, I found myself actually rooting for them. Now I can put them back where they belong. I think I’ve mentioned weeds before in previous postings. Unquestionably this year I’ve seen and pulled more weeds in the garden than ever before and by a wide margin. I took some solace in the fact that it gave me plenty of exercise and provided material for the compost pile. I also gave credit to the improvement in the soil. This week there was a full page article in the Wall Street Journal about the incredible increase in weeds east of Rockies to the Atlantic, North to South, top to bottom. Turns out the reason we’re all experiencing this phenomenon is that last summer was much drier than usual and it was followed by a milder than usual winter and a wetter than normal spring. All of that combined to create the explosion of weeds. West of the Rockies it was exactly the opposite so I guess they’re all seeing a very low weed population this year. The question you’ve been burning to ask is whether or not interplanting Smerelda beans and Blue Lake beans would result in cross pollination or if each would retain it’s individual characteristics. Answer – the Smerelda’s completely dominate. Smerelda’s are the flat, Romano style beans whereas Blue Lakes are the traditional long, slender bean. All we’ve been harvesting are flat beans even though the blue lakes are producing plenty of blossoms. Bass fishing has been different for the past few months. Due to the extremely low lake levels, I really hadn’t done much fishing in our lake at all for the past couple of years but since late June, I’ve started hitting it regularly. In the past, if I went out for an hour or so I’d typically pick up a few small bass in the half to one pound range; maybe something bigger occasionally but lots and lots of small bass. This year I’m getting no small ones but regularly landing 5 pounders. I’m definitely ok with that but it is surprising and bodes well for fall and winter fishing when the large bass generally move closer to the shoreline. I’m going to start catching shiners and freezing them for surf bait. Don’t you think they should be as effective as frozen mullet for catching blues? For sure they’ll be cheaper. I feed the fish off the dock once or twice a day and it swarms with shiners and bluegills. Shiners are bigger and faster and when you first start feeding them, the swarms are dominated by shiners so it’s simple to catch a couple quickly – where quickly means within 10 seconds of starting. They must be smarter than bluegills too because after you catch the first couple shiners, it’s all bluegill after that. I’m throwing a few bluegills into the bag to later serve as frozen bait for the surf but really think the shiners are the trick. I’d like to have a few smaller shiners so I can fish them whole but it seems like they are all 8” or larger. For your interest, these shiners are Golden Naturals as opposed to silver, hatchery grown shiners. The former are much preferred by bass fisherman and cost about $25 a dozen. Silvers are less than half that. My game plan is to pick up a few each day so I have a dozen or so before I hit the beach.